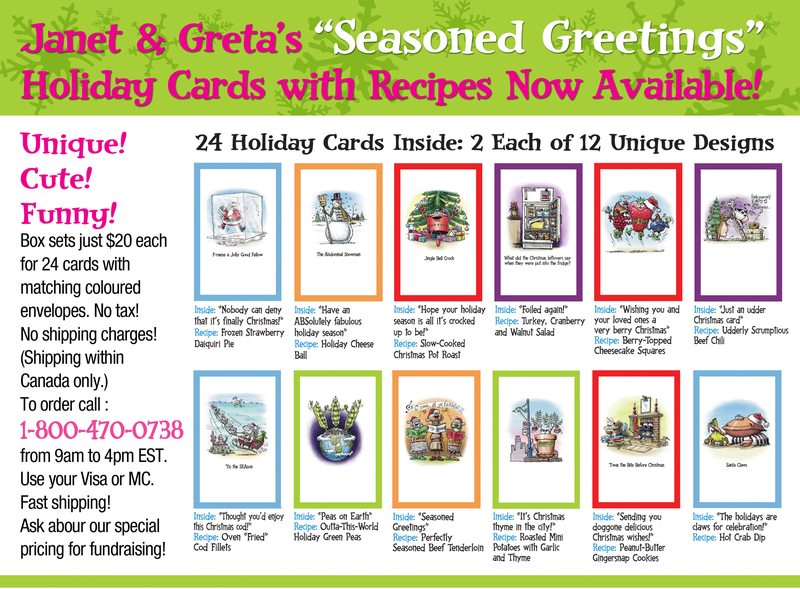 Home » Blog » Holiday Card Box Set (With Recipes) Now Available! Order Today! Super-Fast Shipping. Holiday Card Box Set (With Recipes) Now Available! Order Today! Super-Fast Shipping. Do you think you will ever offer these for shipping to the USA? My whole family is fan of your chicken burgers. They are not available at cosco any more. Can you tell me where else can I get them. I love your show. The recipes are great, your joking about I equally enjoy. I was just mashing up some ripe bananas, and it made me think of a episode you had, I believe it was some sort of banana cake, it was just all about bananas. You topped your cake with light whipping cream, looked great. Can I share a recipe for whipping cream with no cream. Just mash bananas and add egg white, whip and you got great cream to top any dessert. Great way to use up those ripe bananas. unfortunately, I have not yet found the links to the recipies..
followed by a Happy Healthy and Adventure filled New Year!! I combined my gluten free peanut butter cookie (aka Poor man’s) with your suggestions of spices for a gluten free ginger peanut butter cookie. It is very popular with my family. Thanks for these fantastic cards. My family and friends loved them! I bought a box of your Christmas Cards and they were a hit with my coworkers! I had to make a copy of each recipe so everyone had it. Thanks. So glad you enjoyed the cards! Are chicken burgers avaliabe at costco in toronto . I haven’t seen them for very long time.Please let me know . The burgers are awesome and my kids love them . When will the chicken burgers be back in Costco stores. I live in Ottawa and havent seen them for a month. Our kids just love them and are missing them a lot!! I recently found out I have 2 chronic ulcers, can you suggest foods and recipes that would make life with ulcers better? Thank you for making your chicken burgers with caramelized onions gluten-free. They are delicious & I am delighted to have something this great when I want a fast meal. I buy them at Costco in B.C. Thanks. Hi Janet and Greta! I don’t know how you do it! I just made your Roast Feast for dinner on yet another cold March evening. It was absolutely delicious! You have a gift for putting ingredients together to create such wonderful meals. I am so grateful for your cookbook and laugh each time I use it (which is all the time!) and also learn something new each time. Thanks for all you do! I’m a huge huge fan….however I live in Australia..any chance of getting these very unique cards sent my way?? I’ll pay the shipping. ..